Samsung Galaxy Note 9 premieres in less than a month. Meanwhile, the smartphone appeared under the name SM-N9600 in the TENAA list. Unfortunately, there are no photos of the phone for now. The technical specification of the Samsung Galaxy Note 9 smartphone is also not available there. However, this is a matter of the next few days. Samsung Galaxy Note 9 will be presented exactly on August 9 . It is rumored that the phones should go to stores several days later . Recently we could see the smartphone in the poster picture . Meanwhile, a new “notebook” appeared on the TENAA website. Under the name SM-N9600. This is a variant on the Chinese market. In the country it will be the SM-N960F model. As usually happens, TENAA publishes four photos and the technical specification of the certified device. In the case of a Samsung Galaxy Note 9 smartphone it will be like that, but it has not been done yet. At the moment you can get acquainted with the certificate granted to the SM-N9600 model. This one is valid until July 4, 2021. Samsung Galaxy Note 9 has already revealed a lot of information to us. The technical specification is basically known, but it is the information published by TENAA that will be hard proof. For now, the details are all the time based on leaks . Certainly, the Chinese organization will soon confirm the technical details of the phone. By the way, we will be able to see it in the pictures and then it will turn out whether the device will look the same with what we saw in the Onleaks renderings . The Galaxy Note 9 is close to the premiere. Its price in Poland should not change relative to its predecessor. The consolation is that in the basic configuration the new “notebook” will probably get 128 GB of data space. 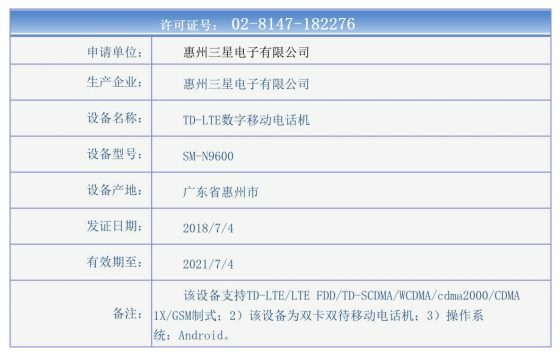 Known technical data of the Samsung Galaxy Note 9, based on the current gossip , you will find below.